Unearthed new evidence (Mangerud and Svendsen, 2018) reveals that during the Early Holocene, when CO2 concentrations hovered around 260 ppm, “warmth-demanding species” were living in locations 1,000 km farther north of where they exist today in Arctic Svalbard, indicating that summer temperatures must have been about “6°C warmer than at present”. 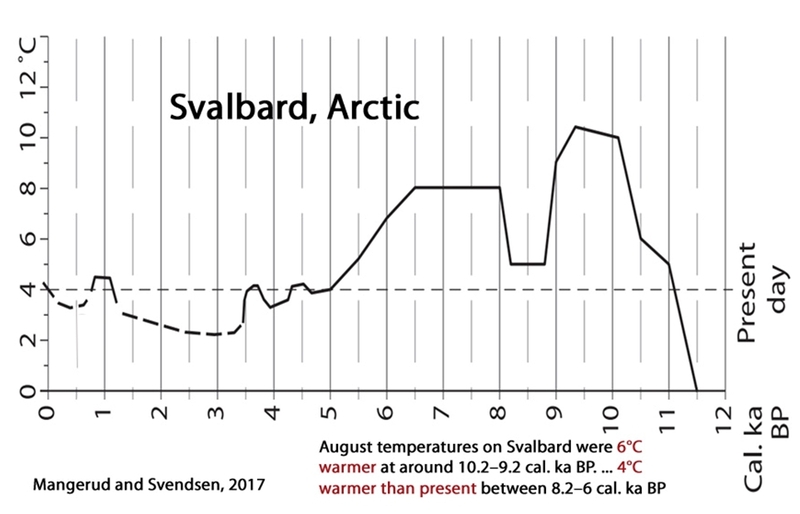 Proxy evidence from two other new papers suggests Svalbard’s Hinlopen Strait may have reached about 5 – 9°C warmer than 1955-2012 during the Early Holocene (Bartels et al., 2018), and Greenland may have been “4.0 to 7.0 °C warmer than modern [1952-2014]” between 10,000 and 8,000 years ago according to evidence found in rock formations at the bottom of ancient lakes (McFarlin et al., 2018). In these 3 new papers, none of the scientists connect the “pronounced” and “exceptional” Early Holocene warmth to CO2 concentrations.